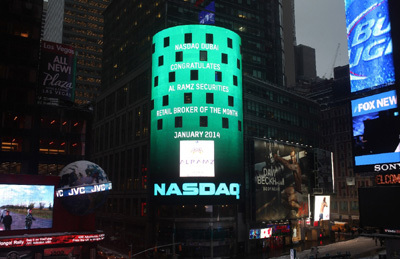 Al Ramz Securities, a leading UAE brokerage house, kicked off 2014 on a strong note emerging on top of Dubai Financial Market, Nasdaq Dubai and Abu Dhabi Securities Exchange trading for January. The brokerage firm traded at Dh8.85 billion ($2.4 billion) to account for 12.14 per cent of DFM’s volume for the first month of 2014 and at Dh8.98 billion or 19.58 per cent of ADX exchange for the same period. Overall, Al Ramz posted a combined volume trade of Dh17.83 billion to corner 15 per cent of monthly volume trade. The second best in the market was six per cent behind, highlighting the market dominance of Al Ramz in January. Al Ramz attributed the strong performance to the excellent work of its team, the strong loyalty of its clients, and the growth of its service offerings into areas such as Islamic Margin Trading and technology-enabled trading via mobile devices. In 2013, Al Ramz achieved an annual average UAE market share of 8.92 per cent. It also posted an impressive 350.50 per cent growth in trade value over 2012, said a senior official. Al Ramz COO Abdel Hadi Al Sadi said: "Our leadership in the DFM, Nasdaq and ADX markets this January is a great start for 2014 and sets the tone for another record year for Al Ramz. It is a testament to our focus on innovation and excellence, two key attributes which have enabled us to maintain our status as one of the best financial service companies in the UAE." "With key developments such as Dubai’s successful bid to host the 2020 World Expo driving even more market activities in the country, we aim to uphold the Al Ramz brand of trading superiority in the coming years," observed Al Sadi. Al Ramz Securities is supported by a team of staff and administrators, brokers and analysts with over 150 years of combined experience in financial services. It is the first company to be awarded a financial consultation and analysis license by the UAE Securities and Commodities Authority, he added.